Östersund elected the most student-friendly town in Sweden! Ingrid Malene Säther, Chair of ÖSIS, Linus Theorell, Chair of the Student Union in Östersund and Charlotta Tjärdahl, Chair of The Swedish National Union of Students, SFS, when Östersund received the award. Photo: Krister Holm. Östersund has been elected the most student-friendly town in Sweden 2018/2019. The award strengthens Östersund´s identity as a university town and a student-friendly town, both important to attract more students to Mid Sweden University. The award is valid one year from 1 July. 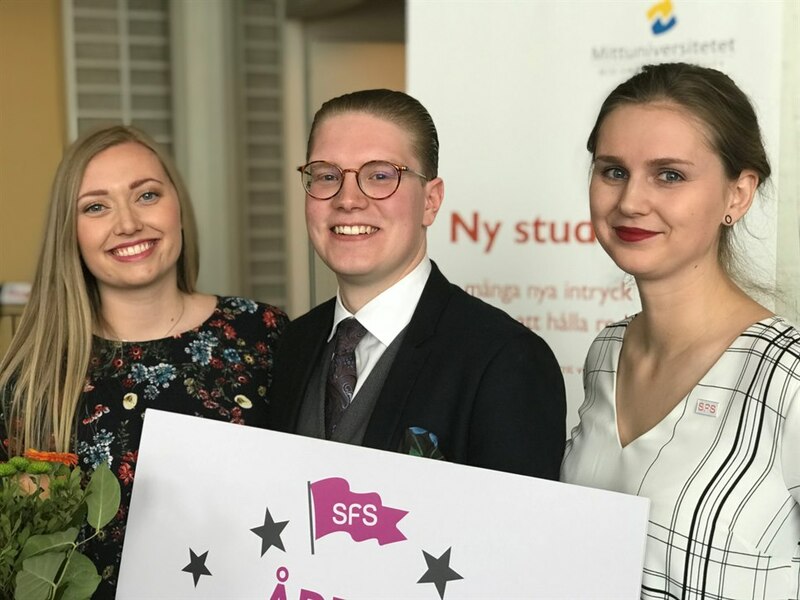 The award was handed over by SFS the Swedish National Union of Students together with the Student Union in Östersund, Mid Sweden University, Diös and the Municipality of Östersund, and the proud winner was announced at a press conference on Thursday. Each year, the award is handed over to a town or city that actively works to improve the students´ lives. − I am very happy and proud of this award! It is an excellent result of our long-term commitment together with Mid Sweden University, trade and industry and the Student Union, and our efforts to make Östersund the most student-friendly town in Sweden, says Anders Wennerberg, CEO of the Municipality of Östersund. The award contributes to making Östersund stronger as a student-friendly town. This is important to attract more students, but also to continue to develop Östersund for the students. During the year as ”The most student-friendly town”, Östersund will, among other things, host the SFS General Assembly, the largest political event for students in Sweden, where more than 300 representatives from the different Student Unions will participate. − I certainly feel that we are heading in the right direction. Last autumn, Mid Sweden University was the university that had the highest increase in terms of reputation in Sweden, and now, Östersund receives this award. We do not rest on our laurels, but we are very happy and this gives us even more energy to be a locomotive for the entire region, says Mats Tinnsten, Pro-Vice-Chancellor at Mid Sweden University. MittÖs is an organization that works to develop Östersund as a student-friendly town, and it consists of representatives from the Student Union in Östersund, ÖSIS, the Östersund Students’ Sports Association, the Municipality of Östersund and Mid Sweden University and also Diös, representing trade and industry. Among other things, they work with issues like student accommodation and introduction of new students. − This award shows that we are doing a good job, and in addition, it is something that will trigger us to make Östersund an even better town to live and study in, says Linus Theorell, Chair of the Student Union in Östersund. A student-friendly town is characterized by dialogue and collaborations, where students have real possibilities to participate and influence. The Municipality of Östersund, Mid Sweden University, the Student Union in Östersund, ÖSIS, and trade and industry in the region have worked together for quite some time in a collaboration forum called MittÖs. MittÖs has the ability to look at complex issues from different angles, where each organization brings their unique perspective to the discussion – and the results are common goals and strategies where the focus is what is best for the students. This extensive work has, and will continue to benefit the students and their right to influence. The town can offer an active life in terms of sports, housing guarantee for all students and a good connection between the university and the surrounding world. To have a safe place to live, an active student life, but also the opportunity to build valuable networks – these are components vital to safety and meaningfulness. This is why the award goes to a town that is not afraid of new challenges. A town that is always focused on development. A town that is prepared to do everything to make the students feel at home - before, during, and after their education.